For nearly half a century, Burden Hall served as a magnet that drew the HBS community together. It is where, in 1971, feminist activist and journalist Gloria Steinem spoke to the Harvard Business Women (today’s Women’s Student Association). Boxing champion Muhammad Ali electrified a packed auditorium when he addressed the Harvard College Class of 1975. And every spring, MBA students have strutted their creative stuff on the Burden stage in the HBS Show. More recently, speakers at the Burden podium addressed challenging issues. Former Vice President Al Gore warned students, “We are managing the planet as if it were a business in liquidation.” Secretary of Labor Elaine Chao (MBA 1979) exhorted the incoming MBA Class of 2004 to restore confidence in America’s free enterprise system after public trust in business had been shaken by the Enron and WorldCom scandals. And in the wake of the global financial crisis, former Treasury Secretary Henry “Hank” Paulson (MBA 1970) advocated for tough regulatory reforms. Burden Hall was made possible by the Burden family, leaders in business and the arts. A big space designed for big moments, it became the focal point of community life at HBS. In the fall of 2017, after 46 eventful years, Burden Hall was decommissioned as part of the redesign of the southeast campus. The auditorium was a gift to HBS from Florence Vanderbilt Twombly Burden and her sons, William A.M. Burden (AB 1927) and Shirley Carter Burden. The hall was named in honor of Florence’s late husband, William A.M. Burden Sr. (AB 1900), and her late grandson, William A.M. Burden III (AB 1953, MBA 1955). William A.M. 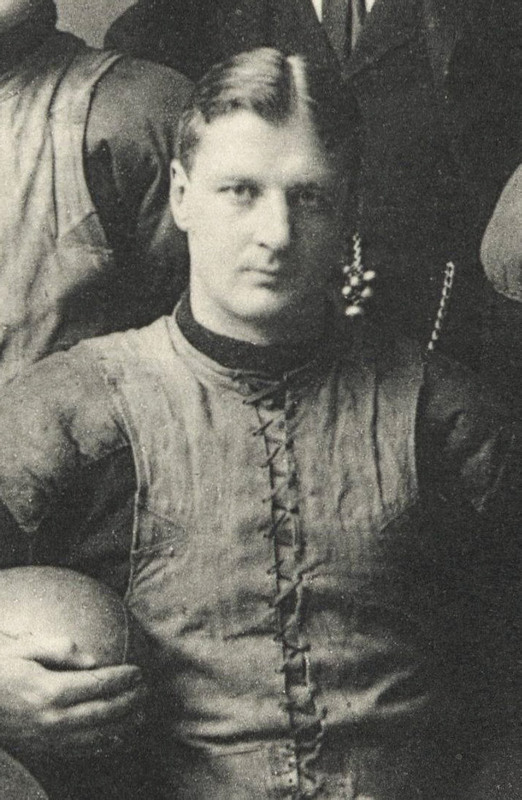 Burden Sr. made a mark at Harvard as First Marshal of his graduating class and captain of the football team. Returning to his native New York, he launched a career on Wall Street with the firm James D. Smith & Co. He died in 1909 at age 31. 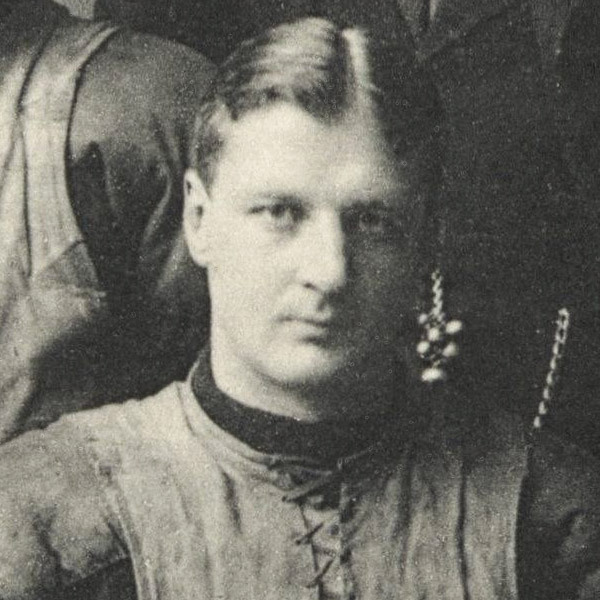 His grandson, William A.M. Burden III, became a journalist after graduating from HBS, working as a reporter with the Washington Post. He was a staff member at the Washington Center of Foreign Policy Research when he died in 1962. The family’s connection to Harvard dates back to 1871, when Florence’s father, Hamilton McKown Twombly, graduated from Harvard College. Her grandson Ordway P. Burden (AB 1966, MBA 1968, HLS 1971) represented the fourth generation of her family to be educated at Harvard and was attending HBS when the cornerstone of Burden Hall was laid in May 1968. Later generations include Frederick Childs (AB 1979, MBA 1988) and Flobelle (Burden) Davis (AB 1991). At the time it was built, Burden Hall was the largest auditorium at Harvard University, with a capacity of nearly 800 and the only place on campus that could hold an entire MBA class. Designed by the American architect Philip Johnson, Burden Hall was the first structure on the HBS campus to break away from the Georgian Revival style. The professional life of William A.M. Burden, son of William Sr. and father of William III, spanned aviation, government, modern art, and business. After graduating from Harvard in 1927, he studied the developing airline industry at MIT and was an aviation business analyst until the early 1940s. His impact on HBS began in 1942 when he partnered with Dean Donald K. David to establish the HBS Research Program on Aviation; he chaired its advisory committee for six years. The program introduced the business of aviation to the HBS curriculum and laid the foundation for the Baker Library Collection on the Business Aspects of Aviation, which includes the William A.M. Burden Papers, aviation investment analyses that Burden prepared in the 1930s. If the aviation industry was William’s first passion, his second, which occupied much of his later life, was contemporary art. He joined New York’s Museum of Modern Art as a trustee in 1943 and was its president from 1953 to 1965, with a two-year break to serve as the US ambassador to Belgium. While William was studying at Harvard, his brother, Shirley Burden, only 16, landed his first job as a reporter and camera assistant with a New York newsreel company. He joined RKO Pictures in California in 1929, rising from production assistant to associate producer. At the dawn of World War II Shirley launched Tradefilms, Inc., specializing in training films for the US military and the government. After World War II, his focus shifted to still photography for high-end architectural magazines. The brothers’ commitment to the visual arts influenced the Burden family’s philanthropic support of Harvard. In addition to Burden Hall with its cutting-edge design, the family has endowed a photography professorship at Harvard in honor of Shirley Burden, and the Florence V. Burden Foundation makes annual gifts to the Graduate School of Design. 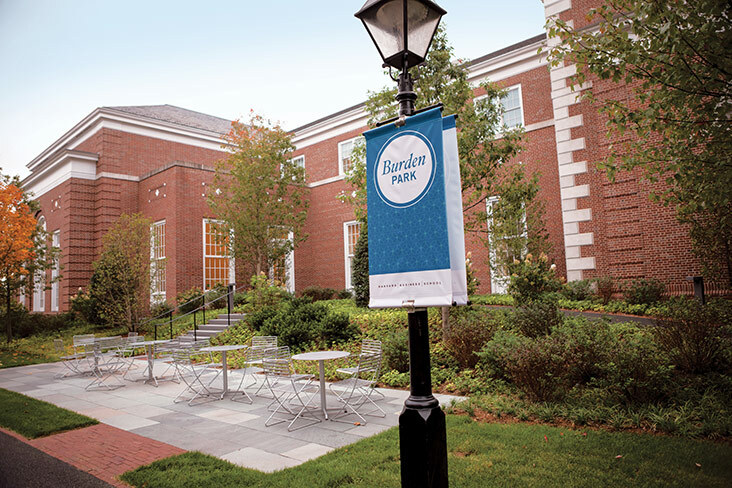 Although Burden Hall is no longer part of the HBS landscape, the Burden family’s legacy remains visible on campus through a new outdoor space and an endowed fellowship recently created by the School in recognition of the generosity of the Burden family. The tree-lined greenspace of Burden Park is punctuated with seating for conversations, study, and relaxing. Burden Park, a broad, tree-lined greenspace between Spangler Center and Klarman Hall, welcomes students, faculty, staff, and visitors as they enter the south campus. It is punctuated with seating for conversations, study, and relaxing. The original cornerstone from Burden Hall is incorporated into the stonework, preserving the history of the auditorium and the family’s generosity. The Burden Family Fellowship supports the School’s need-blind admissions policy and reduces student debt, allowing Burden Fellows to pursue careers based on their passions, as their benefactors did.